I love the nutritionally-hollow-crunchy-deep fried-goodness that are fast food eggrolls. I don’t so much love the nutritionally hollow or calorie laden parts though. Once in a while I catch a lark to make my own egg rolls. This gives me ultimate control over what’s put in and how they are cooked. I’ve come up with the recipe below to satisfy my cravings. ground pork. Chop up with the edge of your spoon or spatula so that you have small pieces of pork throughout. Cook until no longer pink. Add your liquid seasonings and white pepper. 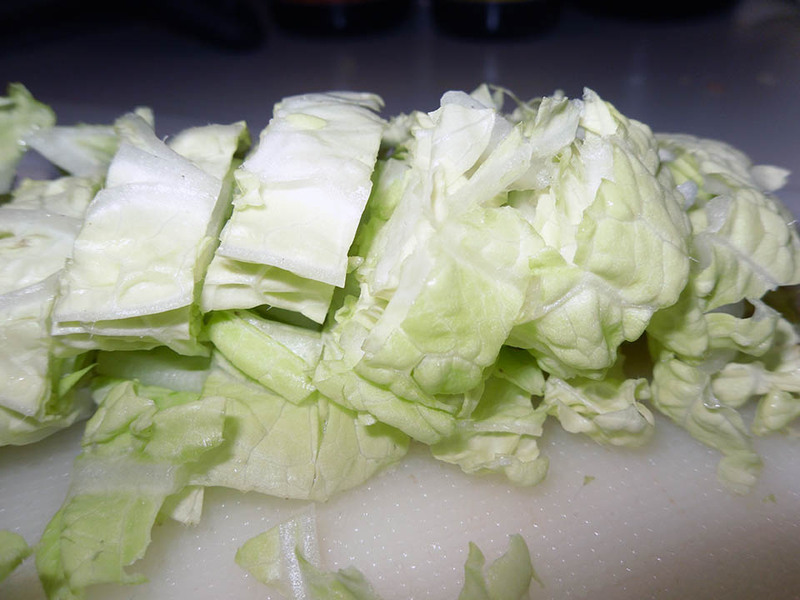 Break leaves off your Napa cabbage and remove the thickest hard white stems. Roll leaves up and slice, as shown in the photo. 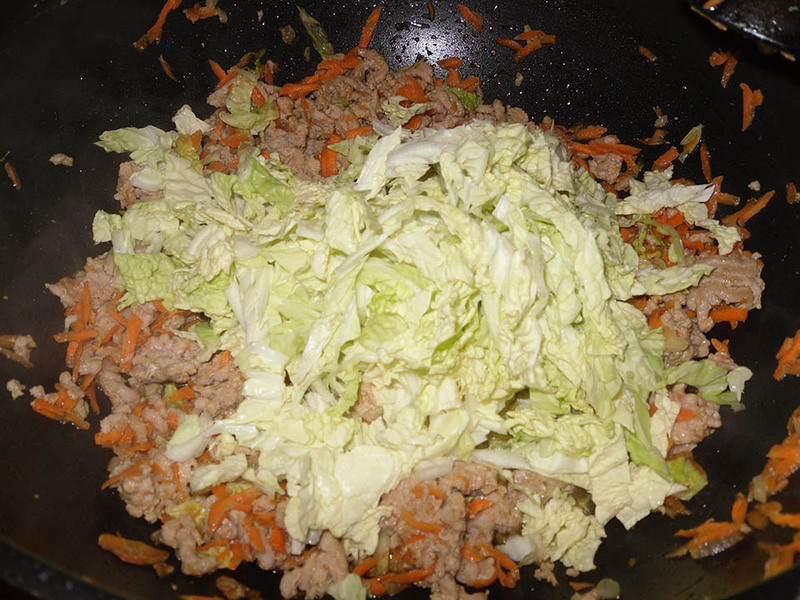 Add your cabbage to the wok as you get it cut. The outer leaves will be tougher and thus can benefit from cooking longer, so when you add them first they get that little bit of extra cooking time. Now I personally cook mine all to pieces. I don’t like a lot of crunch on the inside of my egg rolls. You may like a little more body, if so keep your mixture over the heat just until combined. As soon as the cabbage reduces in bulk a bit, kill the heat, let cool and proceed. 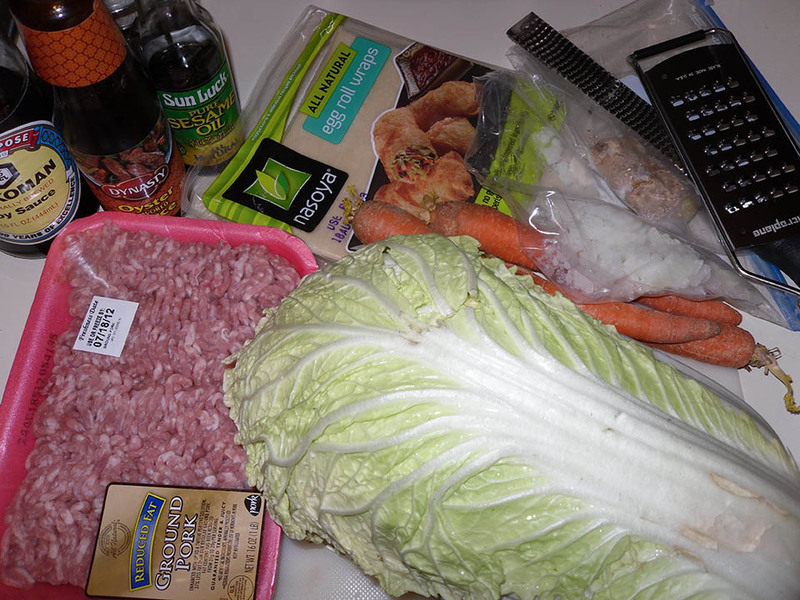 If you’re like me, cook until the cabbage is well incorporated and carrot is completely done. Bring your egg roll wrappers to room temperature and fill a tiny bowl with water. Make an assembly line, filling on the left, then wrappers, then water, then a pan to place them on when finished. Place a wrapper in front of you so that it looks like a diamond and one point is directly facing you. Place 2 Tablespoons of filling and inch and a half up from the point facing you. Take that point and warp it over the filling, bringing the point toward the center of the wrapper. Take the two points to the left and right and bring them into center as well, penning in the filling. Now take a finger and dip it in your water and wet the point facing away from you about and inch and a half down each side. 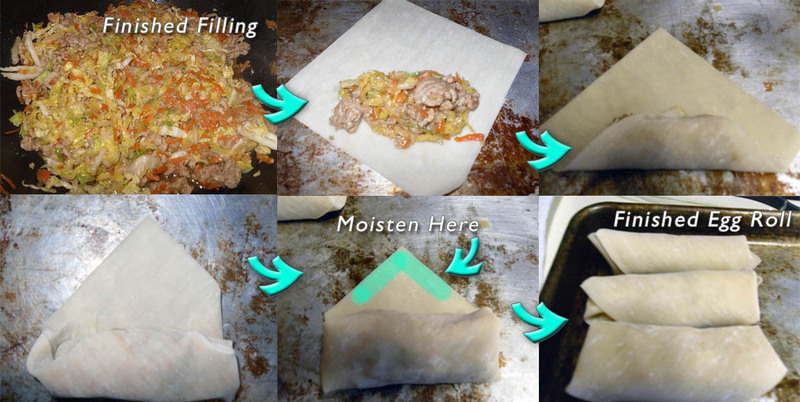 Now wrap the filling part of the roll away from you till it seals on the moistened end. Done! 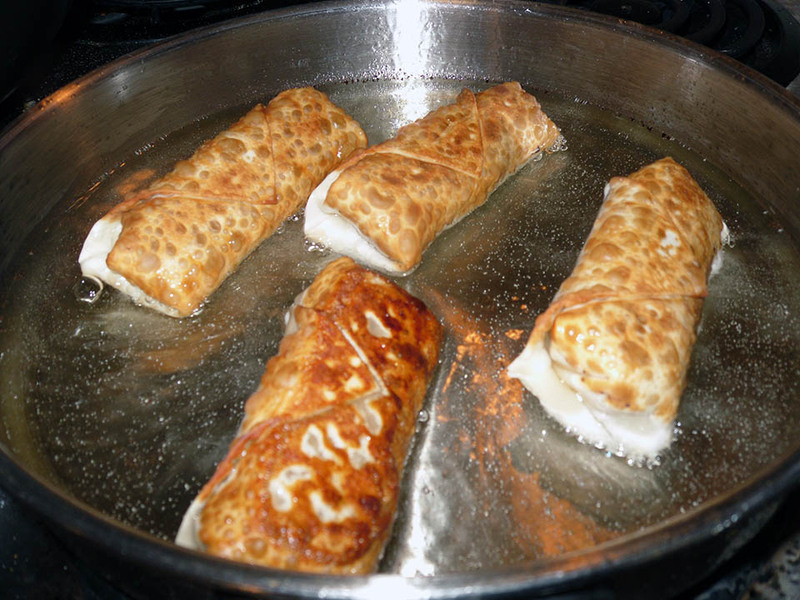 Place your finished egg roll on your pan and make 23 more! Now you can fry these until golden brown on each side (shown) in a straight sided skillet with an inch of vegetable oil (350 degrees aprox.) and serve, OR you can bake them at 400 degrees for 15 minutes or until golden brown. OR, a final option is to do what I do… take the cookie sheet full of egg rolls and place the whole thing in the freezer so they freeze individually (make sure none are touching!) and then once frozen (the next morning) pop them all in a zip top bag. You can bake them directly from the freezer. 350 degrees for 20 minutes. The temp is lower because you want the inside to thaw too… not just brown the outside. 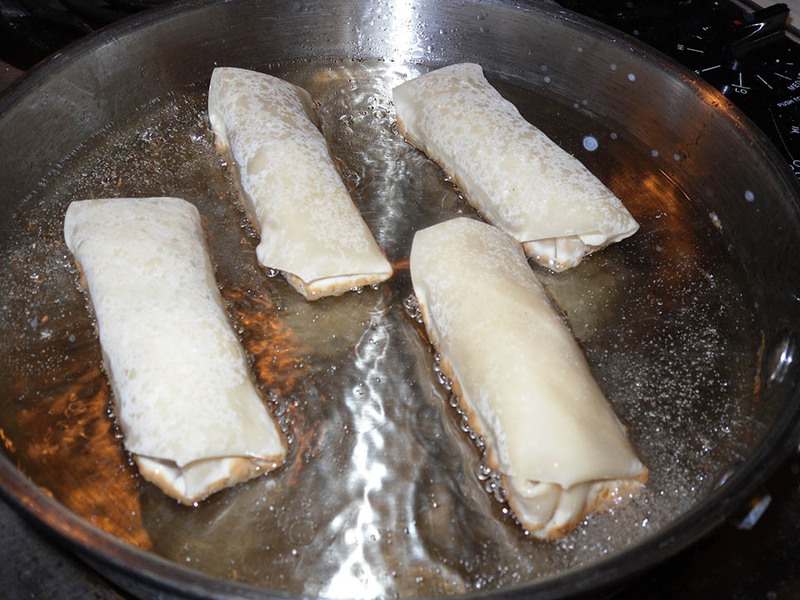 You can make excellent shrimp egg rolls using the same basic recipe. 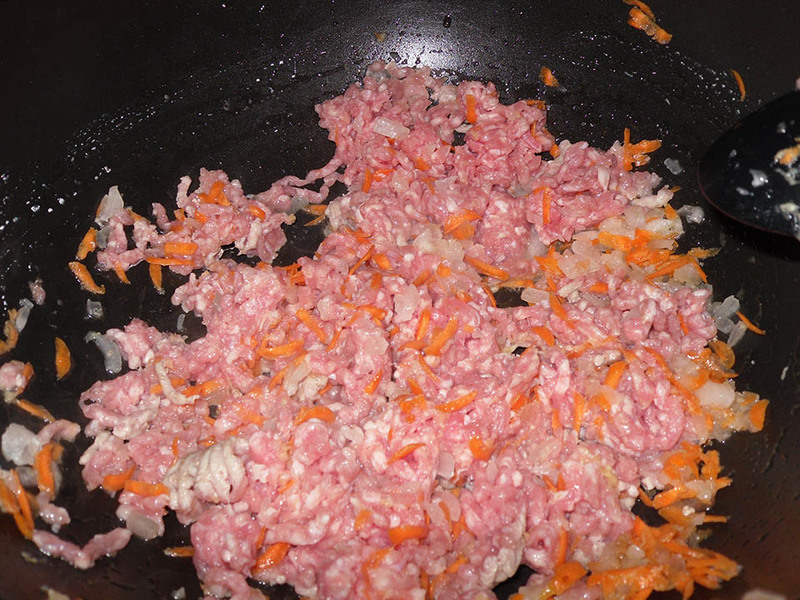 I add 1 cup diced raw shrimp and reduce the pork to ½ pound. You need the pork to add fat to bind the filling and lend a bit more flavor. I also add green onions because they seem to set off the shrimp really well.